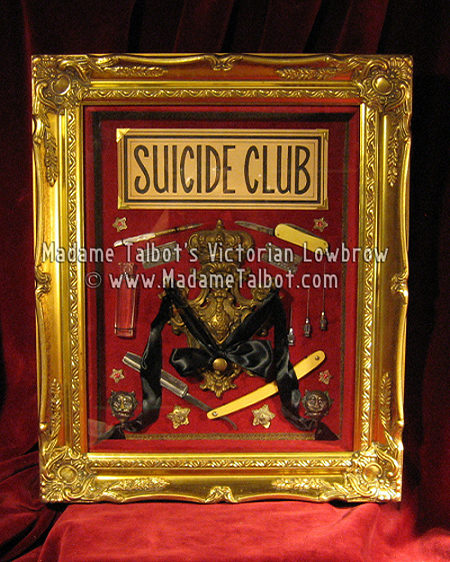 This beautiful framed curio is 17 inches tall by 14 inches wide. Mounted on vintage red velvet is a lovely cache of vintage items such as a Victorian era dip pen, a Victorian era pocket knife, two vinage single edge razors, one Victorian era Chinese opium bottle, 3 vintage hypdermic needles, and a Victorian era straight edge razor. The placard was hand-illustrated black ink on 100-year-old paper and double-mounted with vintage gold mounting corners and trimmed in Victorian gold bullion trim.